One of the very first Compact System Cameras (CSC) to hit the market in 2008, the Olympus PEN series remains a popular choice for consumers on the high street. 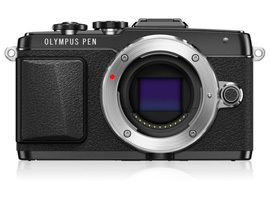 Having developed their CSC range, the Olympus PEN series now offers three clear product lines, with the E-PL, or PEN Lite range, sitting in the middle between their more advanced or beginner versions. Despite fierce competition from the likes of Sony and Samsung developing CSC’s around larger APS-C sensors, Olympus continue to use the smaller Four Thirds sensor type, with the E-PL7 offering a 16Mp Micro Four Thirds Multi-Aspect MOS sensor. With an old-school compact camera feel and sharp line design, the E-PL7 offers a number of feature upgrades over previous E-PL models. These include an improved shutter mechanism with lower vibrations, new user controls and second command dial and a 3:2 aspect ratio LCD screen. Other features include 8fps burst shooting, optional EVF compatibility, wi-fi transfer and 3-axis in-body image stabilisation. We‘ve tested both own brand lenses from Olympus, and third party options from Panasonic and Sigma, covering a wide 12-300mm focal range (equivalent to 24-600mm in 35mm terms) to help you narrow down the right piece of glass for you. 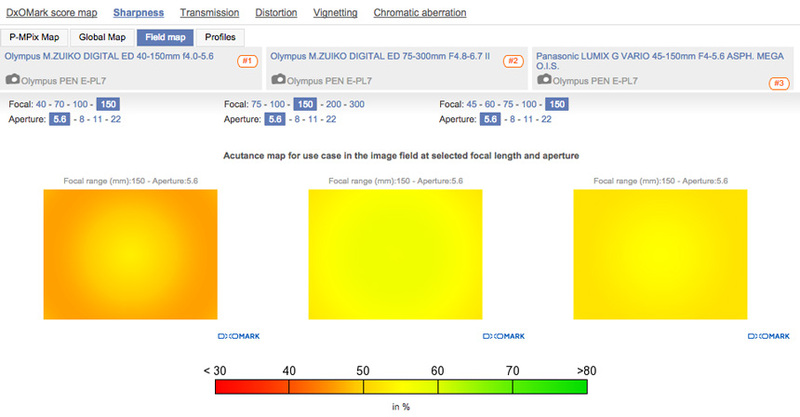 Our technicians have currently tested 18 prime lenses on the Olympus E-PL7, covering focal ranges of 12mm through to 75mm, equivalent to 24mm to 150mm (taking into account the x2 Four-Thirds sensor “crop factor.” Verified scores range from a high of 22 points for the M.Zuiko Digital ED 75mm f/1.8 and Panasonic Leica DG Nocticron 42.5mm f/1.2 ASPH, down to a low of 5 points for the Olympus 15mm f/1.8 Body Cap lens. To help you work out which is the best prime for you, we have analyzed the scores and results for these lenses in three groups: wide-angle, standard, and telephoto. We have put nine wide-angle primes covering a 12mm to 20mm focal range (equivalent to 24mm–40mm in full-frame terms) through their paces on the E-PL7 in our labs. 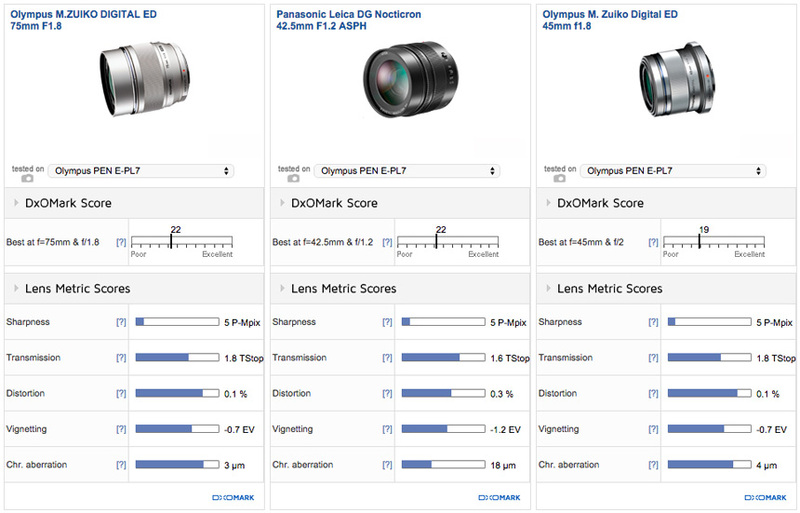 The top three performers all achieve an overall DxOMark Score of 18 points and a sharpness score of 5P-Mpix, with the exception of the Olympus M.Zuiko 17mm f/1.8 that posts 4P-Mpix for resolution. All three offer a fast maximum aperture of f/1.7 or f/1.8, but don’t offer homogenous sharpness at this setting, with softer edge resolution evident. 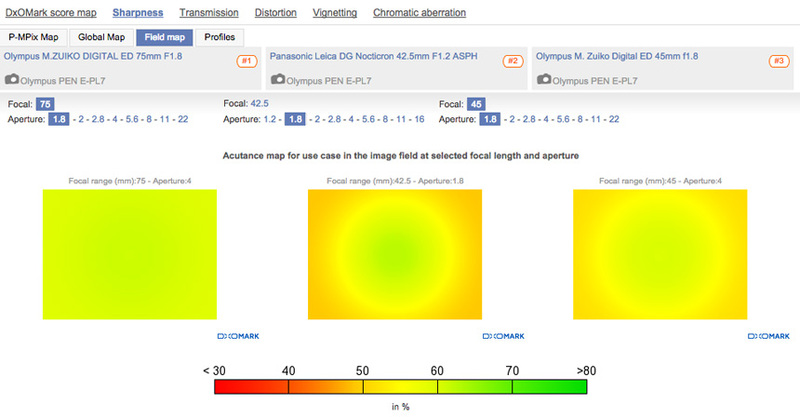 Stop down to f/4, however, and sharpness improves, with stronger and more homogenous resolution recorded on all three lenses. If you’re after a really wide-angle shooting option on the E-PL7, the $769 Olympus M.Zuiko Digital ED 12mm f/2 offers the widest field of view. 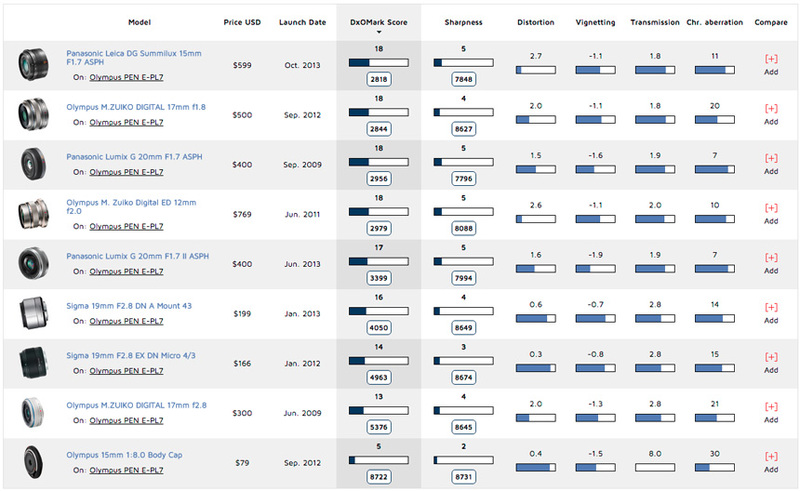 Despite dropping into fourth place in the table, it also scores 18 points overall with 5P-Mpix for sharpness. Distortion is slightly worse at 12mm compared to its 17mm or 20mm rivals, but this isn’t uncommon on such wide-angle lenses. If you can cope with a slightly longer wide-angle focal length, however, the $400 Panasonic Lumix G 20mm f/1.7 offers the best value for the money in this category. A petite pancake option, it’s the smallest and lightest option that boasts similar sharpness and transmission, together with slightly better distortion and chromatic aberration scores, compared to its more expensive 15mm and 17mm rivals. 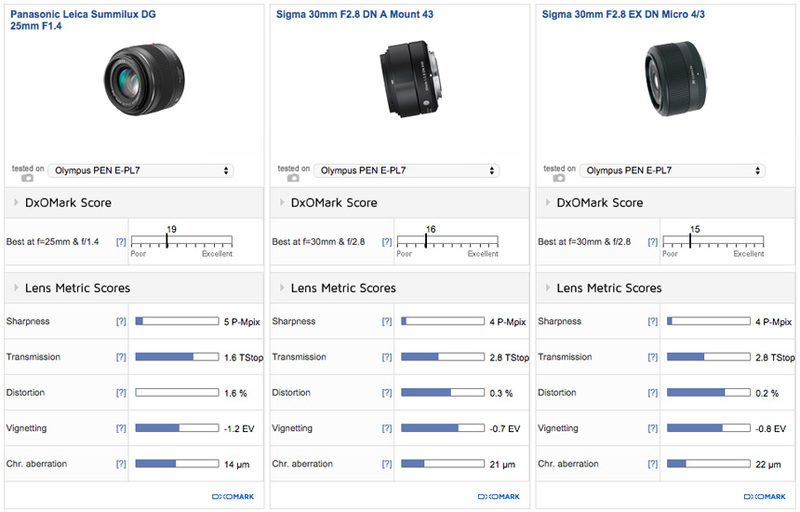 With no Olympus own-brand standard prime lenses tested on the E-PL7, we’ve analyzed the performance of a 25mm Panasonic Leica f/1.4 against two versions of Sigma’s 30mm f/2.8 DN lens. 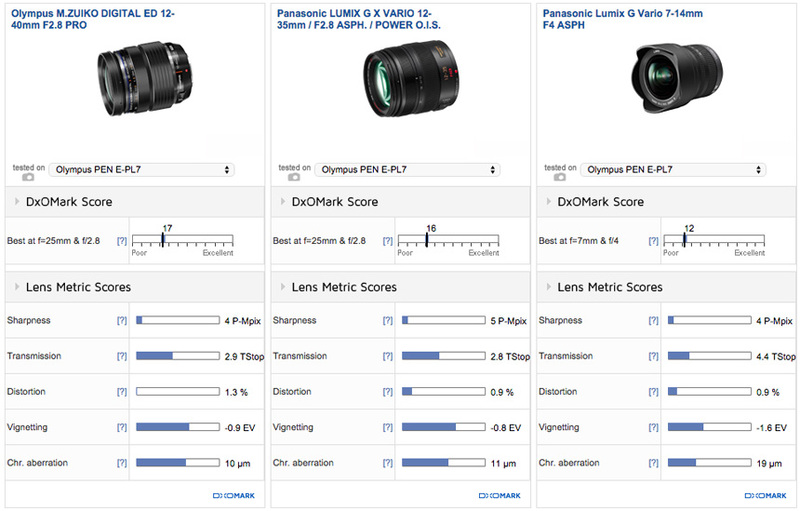 Scores range from a high of 19 points for the Panasonic Leica 25mm to a low of 15 points for the Sigma 30mm f/2.8 EX DN Micro-Four-Thirds option. As with the wide-angle primes, sharpness scores for these primes remain relatively low at 5P-Mpix for the Panasonic 25mm and 4P-Mpix for both Sigma 30mm alternatives. Costing $549, the Panasonic 25mm is a little more expensive, but boasts the often more favorable 50mm equivalent focal length, as well as a wider f/1.4 maximum aperture. In fact, in terms of sharpness, the 25mm Panasonic lens is just as sharp at f/1.4 as the Sigma options at f/2.8, making it a good low-light or background bokeh option on the E-PL7. 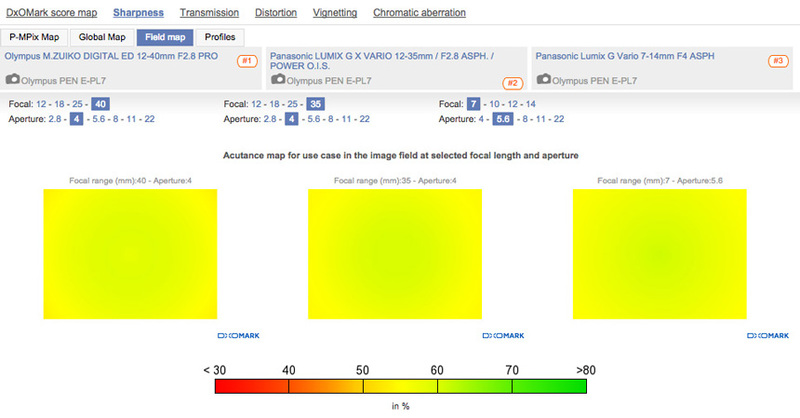 Between f/2.8 to f/11, sharpness on the 25mm Panasonic is more homogenous compared to the cheaper Sigma lenses. 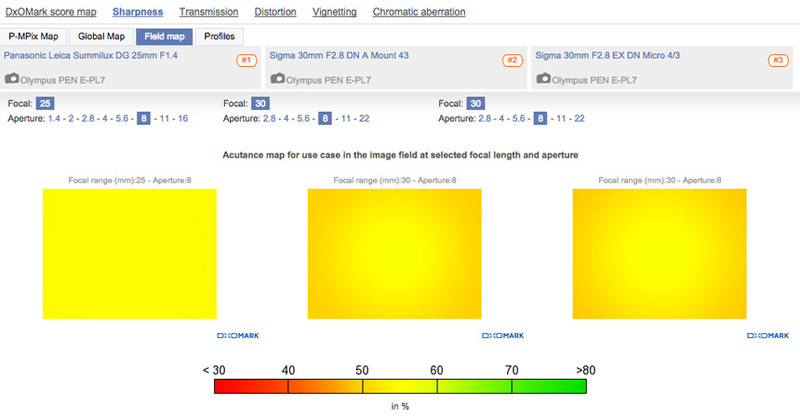 In fact, neither of the Sigma lenses is homogenous at any aperture setting, and sharpness at the minimum aperture setting of f/22 is fairly poor. 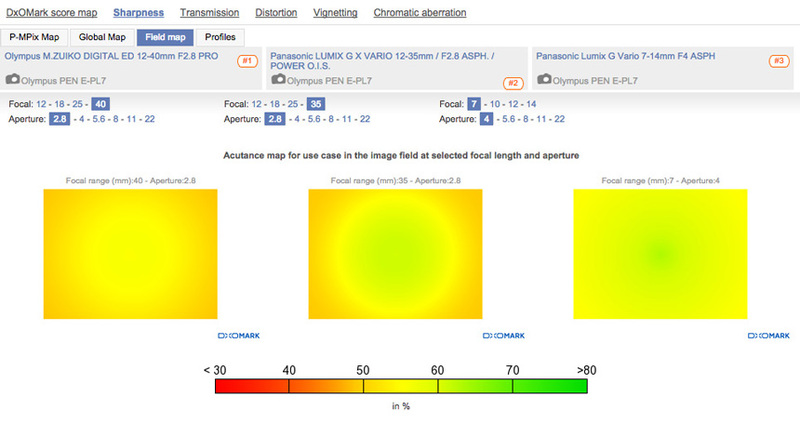 In addition to the best sharpness scores, the 25mm Panasonic also offers better results for transmission and chromatic aberration, but doesn’t fare quite as well for distortion or vignetting. We’ve analyzed the performance of six telephoto primes on the E-PL7, covering a focal range of 42.5mm through to 75mm, the equivalent of 85mm–150mm in full-frame terms. 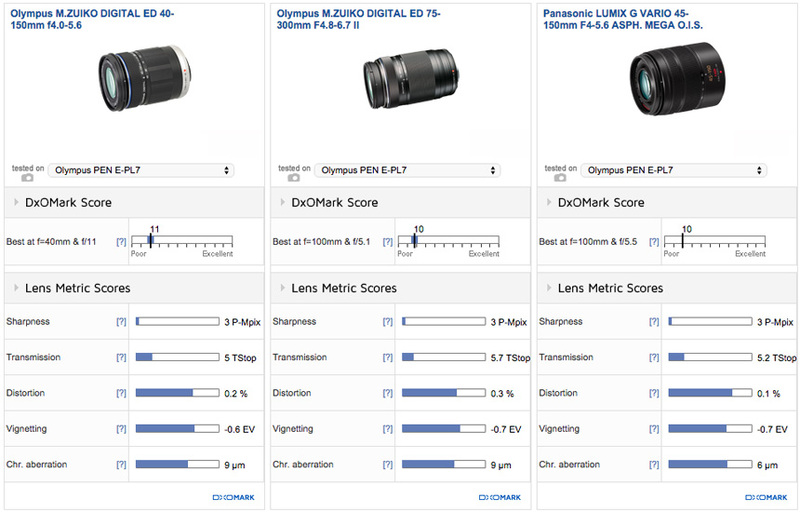 Overall scores range from a high of 22 points for the Olympus M.Zuiko Digital ED 75mm f/1.8 and Panasonic Leica DG Nocticron 42.5mm f/1.2 ASPH, to a low of 16 points for the Panasonic Leica DG Macro-Elmarit 45mm f/2.8 ASPH OIS. In fact, the M.Zuiko 75mm f/1.8 and Panasonic Leica 42.5mm f/1.2 are the best-performing lenses we’ve tested on the E-PL7. If you need plenty of reach, the M.Zuiko 75mm f/1.8 also offers the longest prime lens focal length we’ve tested on the E-PL7. The Panasonic Leica 42.5mm f/1.2 features a wider and more versatile focal length for portraits, however, as well as that “faster” f/1.2 maximum aperture. With a $1600 price tag, the Panasonic Leica 42.5mm is nearly twice the price of the $899 M.Zuiko 75mm, however. At a cost of just $389, the M.Zuiko 45mm is the bargain of the bunch, which despite dropping into third place overall with 19 points, offers comparable results on the E-PL7 with the pricier competition. Tested on the E-PL7’s 16Mp Four-Thirds-format sensor, sharpness scores for even the best lenses remain low at around 5P-Mpix. At the maximum aperture setting of f/1.8 or f/1.7, the M.Zuiko 75mm offers the strongest and most homogenous sharpness of the three lenses, with the Panasonic Leica 42.5mm softer in the corners by comparison. All three telephoto primes offer the best sharpness at f/4, with the M.Zuiko 75mm and Panasonic Leica 42.5mm a little better in the corners compared to the cheaper M.Zuiko 45mm f/1.8 alternative. 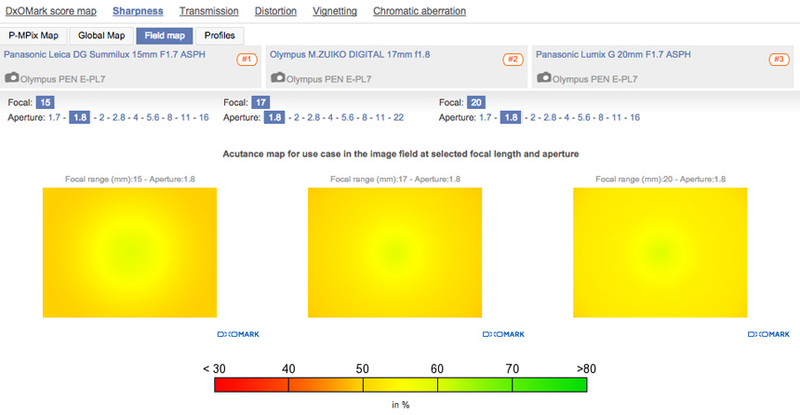 Our technicians have currently tested 18 zoom lenses on the Olympus E-PL7, covering focal ranges of 12mm through to 75mm, the equivalent to 24mm to 150mm, taking into account the x2 Four-Thirds sensor “crop factor.” Verified scores range from a high of 17 points for the Olympus M.Zuiko Digital ED 12–40mm f/2.8 PRO standard zoom down to a low of 8 points for the Olympus M.Zuiko Digitial ED 75–300mm f/4.8-6.7 telephoto zoom. To help you work out which is the best for you, we’ve analyzed the scores and results for all the zooms in two groups — standard and telephoto zoom. 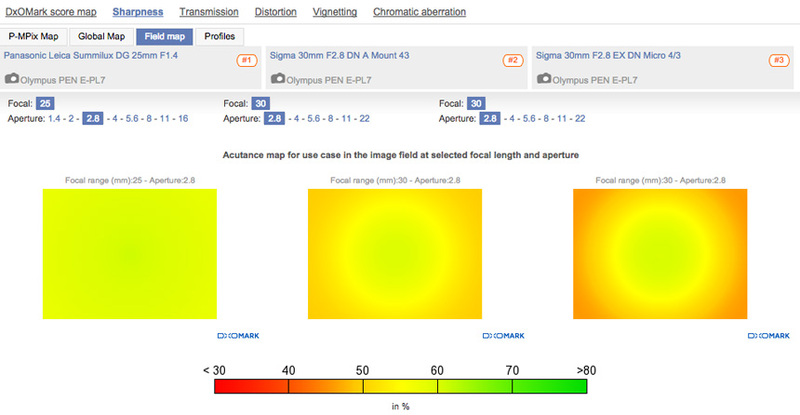 The top two standard zooms offer a similar focal range and comparable scores, and sit in the same price bracket. The slightly more expensive $1129 Panasonic LUMIX G X VARIO 12–35mm f/2.8 ASPH Power O.I.S has a slightly shorter focal range compared to its Olympus 12–40mm rival, and although it boasts image stabilization, so does the E-PL7 body, so it isn’t really required. Both top lenses feature a fixed f/2.8 maximum aperture through the focal range, however, which is more important for successful low-light shooting. 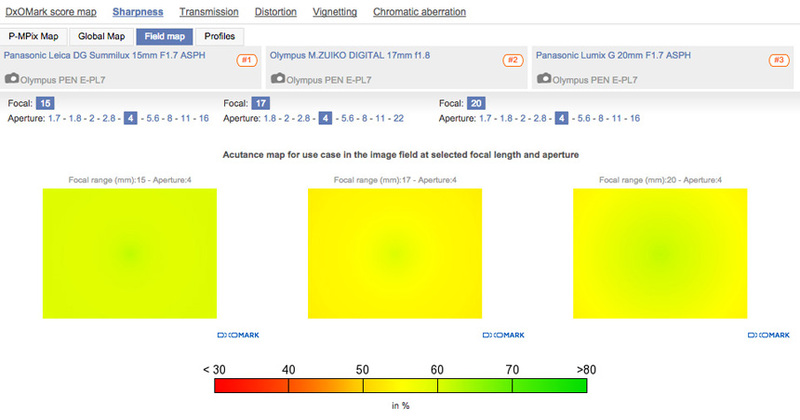 The Panasonic version just gets the nod for sharpness with 5P-Mpix compared to 4P-Mpix for the Olympus version, but neither are outstanding in this regard, and their other lens metrics are similar, too. Shooting at the longest focal length, edge softness is evident on both lenses at the maximum f/2.8 aperture, with better results achieved when stopping down to f/4. The Panasonic LUMIX G Vario 7–14mm ASPH makes the podium, too, and also offers the widest focal length available on the E-PL7. With the lowest transmission score of 4.4 TStop, the Vario 7–14mm provides a relatively dark viewfinder image, as well as lower vignetting and chromatic aberration scores, but if you need an ultra-wide on the E-PL7, this is the lens for you. For sharpness, the Vario 7–14mm performs marginally better at the wider focal lengths using apertures between f/4 and f/8. We’ve tested seven telephoto zoom lenses on the E-PL7, covering a 40mm through to 300mm (80-600m equivalent) focal range. Designed for the petite Micro-Four-Thirds system, the optical performance of these relatively small and lightweight telephoto zooms can’t compete with the prime or standard zoom lenses on the E-PL7. Unlike the larger professional-grade telephoto zooms available for APS-C and full-frame DSLR cameras, the physical constraints of designing for the Four-Thirds sensor means that these telephoto zooms all feature slow, variable maximum apertures. The aperture will open to f/4.0 or f/4.8 at the short end of the zoom, but stops down to f/5.6 or f/6.7 when fully zoomed in, meaning you’ll need pretty good light to achieve fast shutter speeds at the long end of the zoom. With a top DxOMark score of 11 points, the Olympus M.Zuiko Digital ED 40–150mm f/4.0-5.6 is the top-ranking telephoto zoom on the E-PL7. It is only marginally ahead of the competition, however, with the lowest-scoring Olympus M.Zuiko 75-300mm f/4.8-6.7 just behind with 10 points. Sharpness scores are low, too, with all tested telephoto zooms only managing a score of 3P-Mpix. 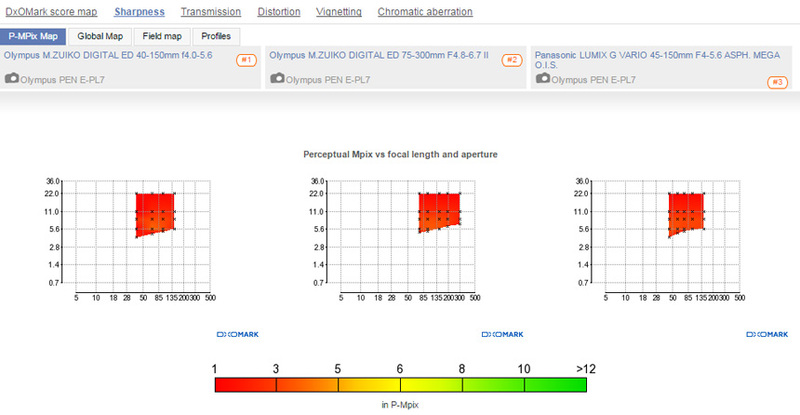 If we analyze the optical performance of the best telephoto zooms on the E-PL7, you can see from the Sharpness P-Mpix Map that they offer relatively poor resolution at all focal lengths and aperture settings. 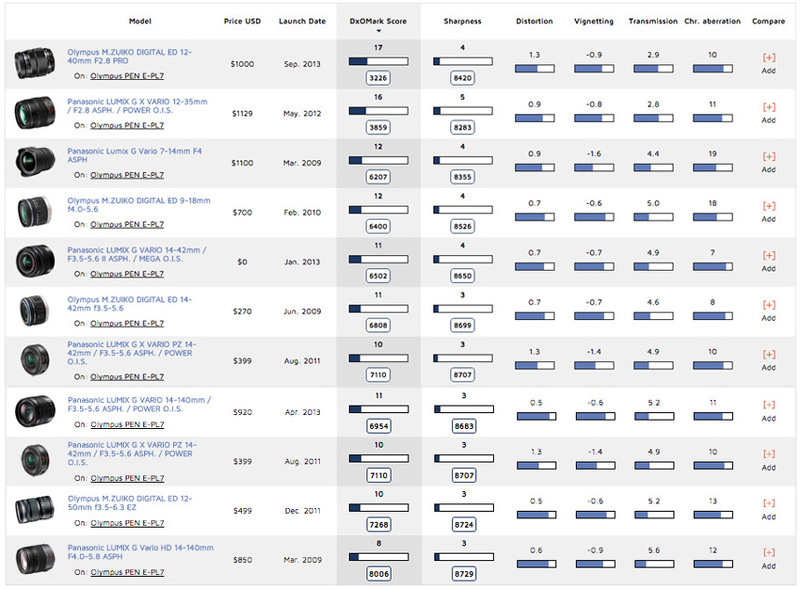 In fact, the odd anomaly aside, the seven telephoto zooms share similar lens metric results across the board, so choosing between them really comes down to features and budget. With incredible reach, the $550 Olympus M.Zuiko 75–300mm f/4.8-6.7 II has the greatest focal range, but also the slowest apertures at f/4.8–6.7. If it’s a super-zoom you’re after, and can live with a 100mm focal length at the short end, the $600 Panasonic 100–300mm f/4.0–5.6 O.I.S looks like a better option, with a faster f/5.6 maximum aperture at 300mm. For a more conventional standard telephoto zoom range, the $236 Olympus 40–150mm f/4.0–5.6, the $300 Panasonic 45–150mm f/4.0–5.6 O.I.S, the $383 Panasonic 45–175mm f/4.0-5.6 O.I.S, and the $255 Panasonic 45–200mm f/4.0–5.6 O.I.S all offer a similar proposition. Yes, the Panasonic versions feature lens-based image stabilization (MEGA O.I.S), but this feature is already built into the E-PL7 body.